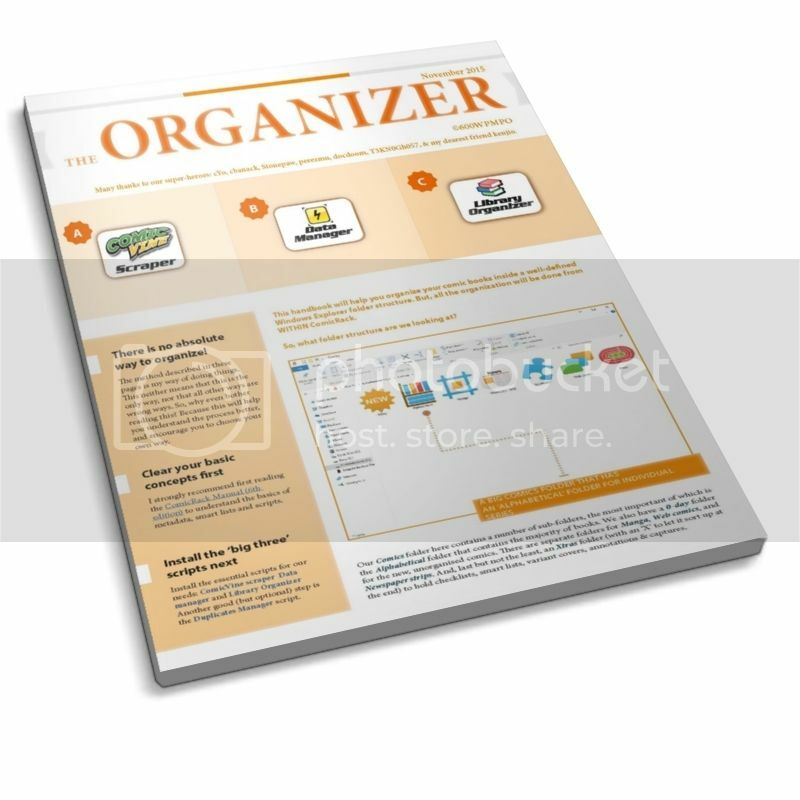 Presenting the 2nd Edition of the Organizer Handbook! This handbook will help you organize your comic books inside an alphabetical Windows Explorer folder structure, where we have a folder for each alphabet, and inside each alphabet folder, we have folders for individual series, with the publisher name in brackets. What seems to be a fairly over-simplified way of organizing comics, turns out to be a very complex (but well-organized) system of assigning comics to folders & sub-folders. Last Edit: 3 years 5 months ago by 600WPMPO. Thank you for the Organizer 600WPMPO. Thank you - I am really looking forward to reading it. sweet. been waiting for the updated version of this, been making headway on my collection with the older manuals, and some trial and error. this will def help me streamline the process. Do you not also sort TPBs? I don't see any instructions on that. I haven't looked through it yet, but your original Organizer helped me to clean my stuff up. Following this guide closely when i came across an odd bug. It has to do with data manager, i have it setup and i imported the setup but after running it sever comics will not leave the Data manager smart list any idea hat could be causing this? Uplinkpro, I think more information will be necessary to assist you. Exactly what are you doing when it happens, what happens (sounds like it hangs on Data Manager and doesn't return focus back to comicrack...? ), are there any error messages, any log files, etc. Upload some screenshots or even a video if possible. Dude, this guide is great. I'm not sure if I'm ready to take the plunge and reorganize in this fashion but it's really well written. I'm seriously considering applying it. I'm having the same issue as Uplinkpro. My trouble is with the Datamanager.processed custom field. It doesn't appear to exist, and since the smartlist is searching for information in that field, it's obviously not finding it. I'm using Windows 10, and best as I can tell there's some kind of access issue going on where it can't add that custom field. I tried adding it manually, and it just disappears. If I find a solution, I'll post it here.